I just wanted to thank the lovely people at Phusei for sending me the latest images of our seating at the Head Office at 1 Angel Square, London. The seats look amazing, especially against the night sky. We love it when past customers come back to us so when Phusei who we'd worked with on the Co-Operative Groups HQ gave us the contract to supply seats to Microsoft in London, we were thrilled. Microsoft chose a stunning combination for their outdoor space of our Kirv Bench in black and our Hi-Rise Bench in yellow. The seats are already in use and we'll post some images as soon as we get them. The Co-operative Group is the latest company to commission seats from Kirv. The collection of apple green Hi-Rise and Kirv Benches will be used on the terraces of the newly built company headquarters at the heart of the Co-operative Group's £800m regeneration of the north of Manchester's city centre. The new district named NOMA includes office, retail, residential and leisure space and will eventually generate its own power. The Co-operative Group’s principle of ‘profit for a purpose, putting people and communities first’ is at the heart of NOMA a socially responsible project. The construction of the company's new headquarters has already created essential apprenticeships and boosted the skills profile within the city. 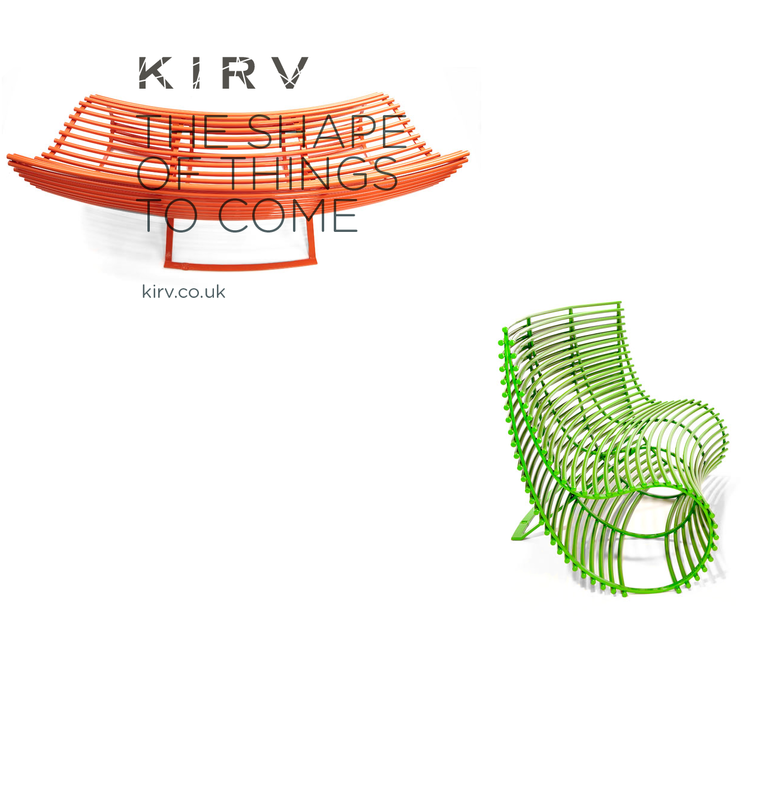 Everyone at Kirv are really proud to be associated with the project and with such a great British company. We get loads of comments about how fantastic our website is and we're very proud of it. It shows off our products beautifully, is easy to navigate and has just about the right amount of information. But and it's a big one, we've only recently realised that the Consultation Request facility has not been working and for some time. We're gutted to think that any of you lovely people might have been waiting for us to reply to emails that you sent. So just to be clear, our email contact wasn't working, it is now. So if you'd like to ask us anything, click away, we'd love to hear from you. We're starting the new year with some great news for all our customers. Following negotiations with a couple of our main suppliers, we've managed to substantially reduce our material costs. We've managed to do this thanks to the rapid growth of Kirv, especially overseas where our style is increasingly appreciated. Rather than pocket these savings and increase our profit, we've decided to pass them onto you, our customers and reduce our prices. We're very aware that the financial recession is still affecting trade internationally and we hope that by reducing our costs and providing a new pricing structure, we are doing our bit to keep competitive. For more information on pricing, contact Kim direct at kim@kirv.co.uk. If like me, the warm autumnal weather is doing nothing to generate any festive feeling, why not take a look at our decorative stainless steel spheres. Their geometric form is made from solid stainless steel bar that's been electro-polished for a lasting shine. They can be used indoors as well as outside and just may add a touch of glamour to the long grey days ahead. Hang them or wrap them in tiny lights and use them as a centrepiece on tables. Perfect! People often ask us who our customers are. The answer is they appeal to a wide cross section of trades - architects, designers and landscape gardeners - as well as to private individuals. Our seats can be used to complement existing schemes or to be a compelling focal point. We recently delivered a Kirv Nest to a private residence in Hertfordshire. The couple had first seen our seats at The Affordable Art Fair in London. Their garden is a large formal one and the Kirv Nest was chosen to both complement the planting, while adding a contemporary spin to the feel of the outdoor space. As you can see from the photo, the form of the seat beautifully mirrors the box spheres that are dotted around the hedging, while the mirrored shine of the stainless steel reinforces that this is a modern garden. Our customer is thrilled with her new seat and we're pleased with it's new home. All the months of preparation were worth it when the opening day of 100% Design came. The stand, thanks to Alex's hard work, looked fantastic. Mark from EXP Design joined us for the opening morning which was lucky as the stand overflowed with people. There was a real buzz on the day which I think everyone felt. We had a lot of journalists visit us and have since been featured in several titles and blogs around the world. The 100% Insider Guide featured our Kirv Bench and it seems that this seat more than any other is capturing people's imaginations. We want to say a big thanks to the people who have already promoted our seats - Design Milk, Apartment Therapy, Eco Therapy, Homes & Interiors Scotland - and to the many journalists across the globe who are currently writing pieces. It was a pleasure to meet you all at 100% Design and thank you for your interest. We'll look forward to seeing you all again next year. Right now 38 hours feels like a very small amount of time. That's all we have left until 100% Design opens its doors to the public. It's our first time at the show so we want everything to be perfect. We've been working hard to get the stand looking good, co-ordinating our new corporate literature and get our fantastic new website finished. Then of course there are our seats. They all need to look immaculate so we've been washing and polishing all day. Our newest addition to our collection is the Kirv Otto. Alex collected it yesterday from the finishers and it's looking great. We're so pleased with its curvy form and the lovely contrast of wood and powder coated stainless steel in it. I think it's going to be our new bestseller. But don't take my word for it, come and see it on our stand - F58 - and tell us what you think.